First I make two pinch pot cups and join them together into “eggs”. 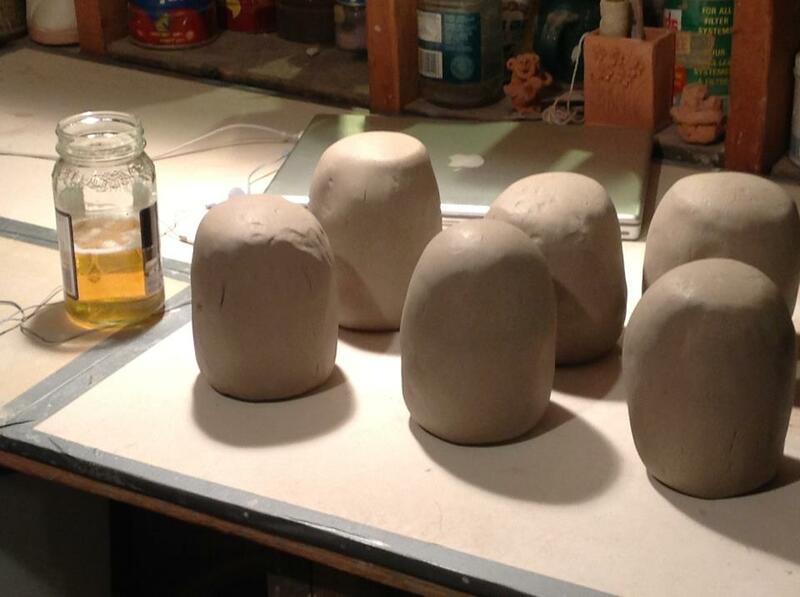 These eggs are the first step in many of my 3D pieces.I paddle them to make them smooth and to strengthen the join. Sometimes beer is essential to the creative process and it tastes better out of a spaghetti jar. 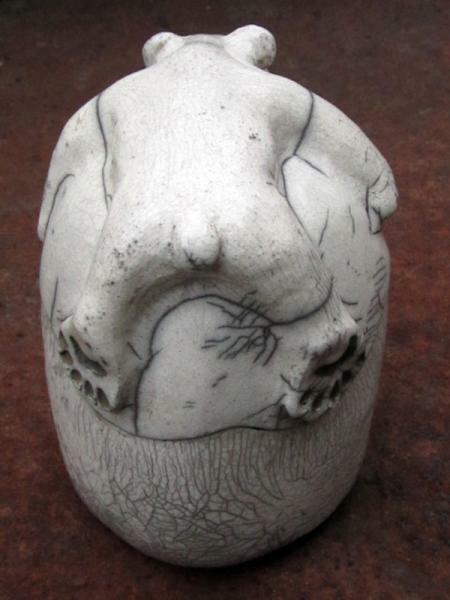 I then roll out a flat slab of clay and cut out a “polar bear rug” shape. 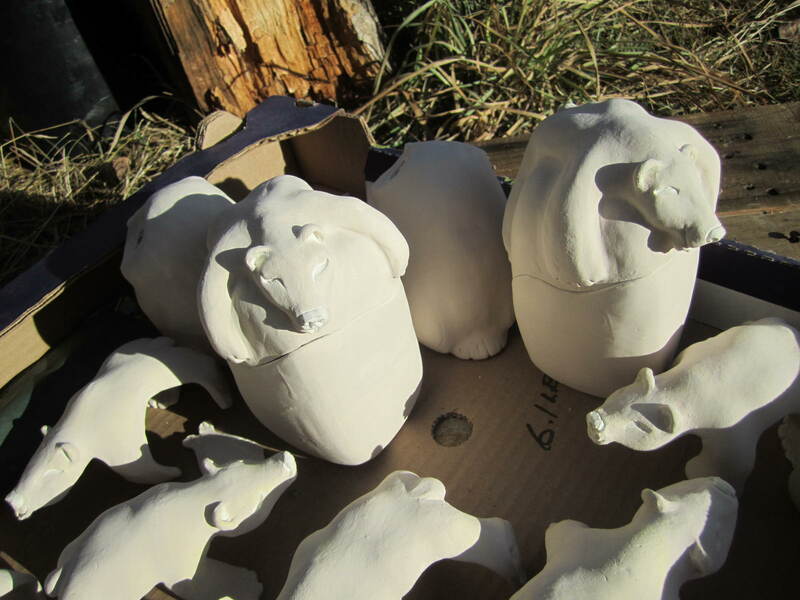 I form that into a 3D bear by pushing up from the underneath of that clay cutout and adding pieces onto the top. 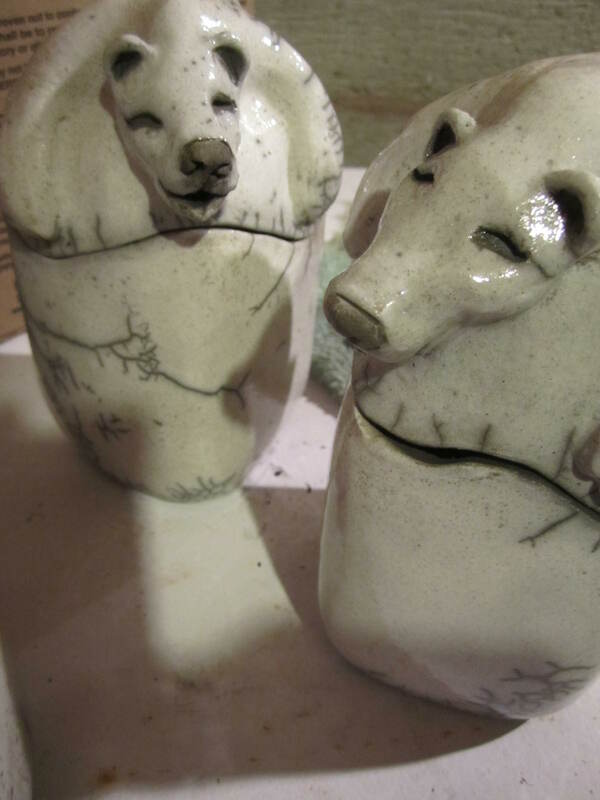 I then drape that bear shape over the box and join it to the top with the handle of a spoon and some other tools. I add ears, eyes, nose and tail and using a stamp I made I press the footprint onto the foot. After drying a bit to the “leather hard stage” I draw a line around the box with my needle tool and then cut along that with a narrow X-acto knife to form a top and a bottom. Then I cut out the ridges inside that were formed when I joined the two “cups” together in the first stage. This makes the inside of the box smooth. I also smooth the edges of the cut that I made. 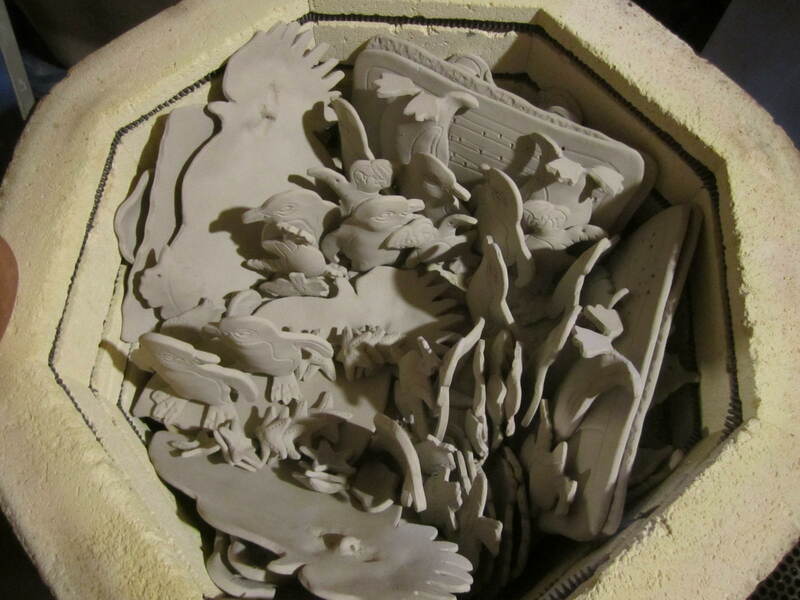 After drying for a few days the boxes are loaded into the kiln. Yes, they really are in there, but by the time I remembered I was supposed to take a photo they were about three shelves underneath this one. But that is the colour of the clay when it is dry and that is how full I can pack the kiln! I do a bisque firing to cone 06 (which is about 1800 F. I don’t know what it is in Celcius. Yes, I know, I am Canadian I am supposed to think in Celcius, and I do, but for cones I use Fahrenheit, it’s all darn hot anyway!) This is one of my old kilns which now resides at my mum’s place. I told you they were in there! 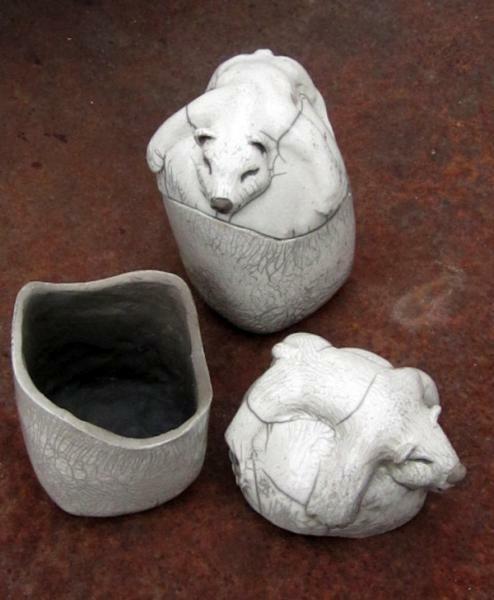 The boxes in the kiln after firing. 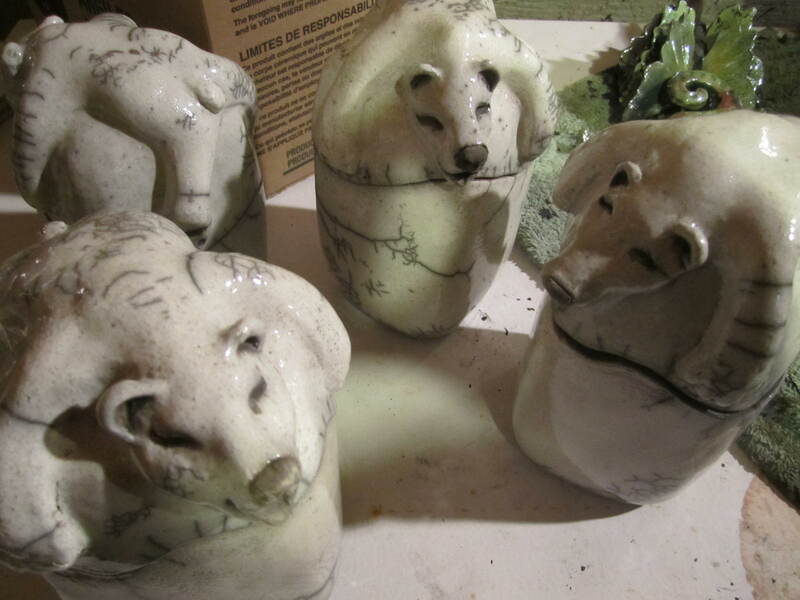 See how the clay turns very white after firing? This is Tuckers White Sculpture clay. It is without a doubt the best clay I have worked with for Raku. It is forgiving and dries quickly and fires to a bright, bright, BRIGHT white which works really well for the clear crackle glaze that I use. In fact I like it so much I had boxes shipped at great expense out to my parent’s place so I could work with my own clay (not available in British Columbia or many places west of Ontario) when I was there making stuff for the Medieval Market in November. The boxes after glazing. Everything I glaze will be white with crackles and the parts that I don’t glaze like the eyes, insides of ears, nose and foot pads will turn black from the smoke in the post-firing reduction. I place the tops and bottoms of the boxes into the kiln separately so they don’t stick together while they fire. For potters who are interested I glaze them with the good old 80 % Gerstley Borate 20 % Nepheline Syenite recipe which is a clear glaze. It makes a nice bright white on the Tuckers clay. I tested a bunch of other sculpture clays and none fired as white as this one did. 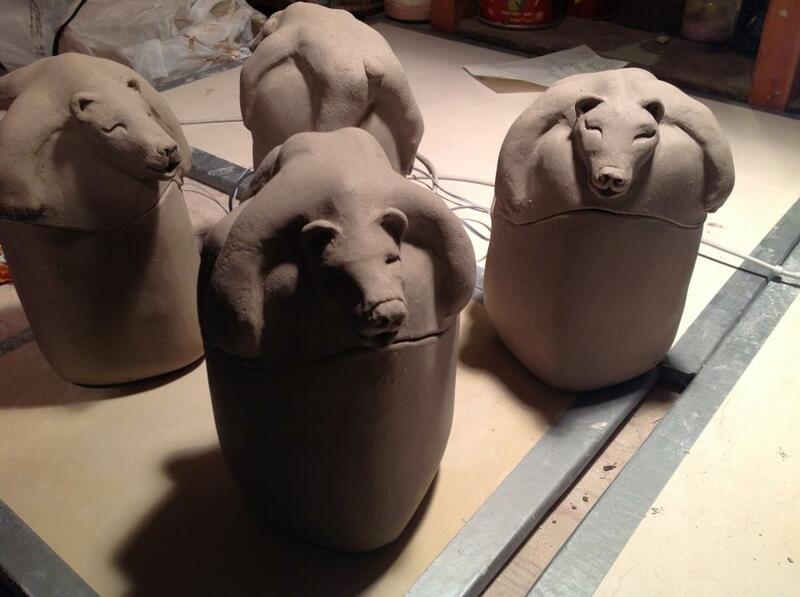 The boxes go into the kiln and are fired for a couple of hours. 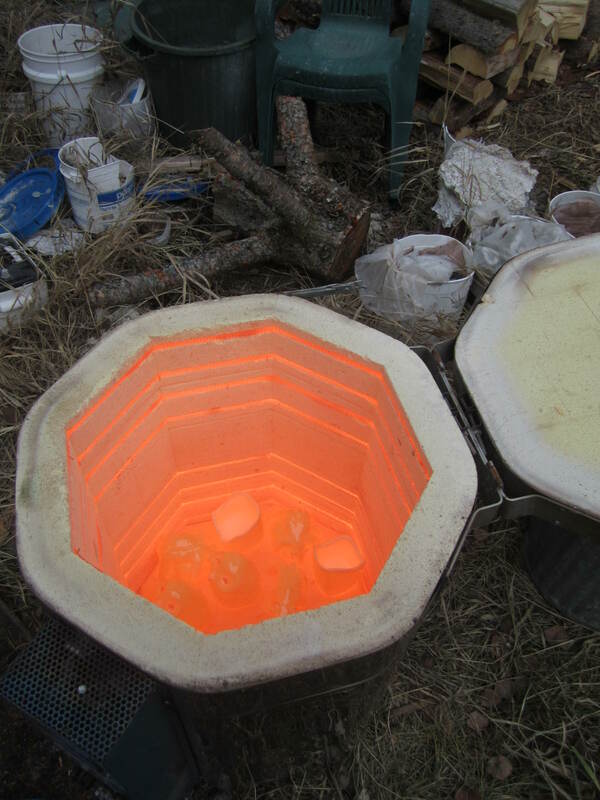 I do all of my raku firings with an electric kiln. I used to use propane but find that the slower electric firing gives a more even melt. Also I can fire more pieces at one time and it is WAY less strenuous on my body as I am not spending the whole day pulling pieces out of the kiln like I used to do when I fired with a propane garbage can kiln. There’s a lot to be said for the portability of the garbage can kiln though. There is a good book on alternative firings and kilns that I have and still refer to which has info on kiln building if you are an interested potter. SO! After the boxes are in the kiln for a few hours I check through a little peep hole in the side of the kiln to see if the glazes look shiny and “wet”. If they do then I don all sorts of heavy clothes, gloves and a respirator mask and turn the kiln off (very important as I am about to stick metal tongs into an electric kiln). 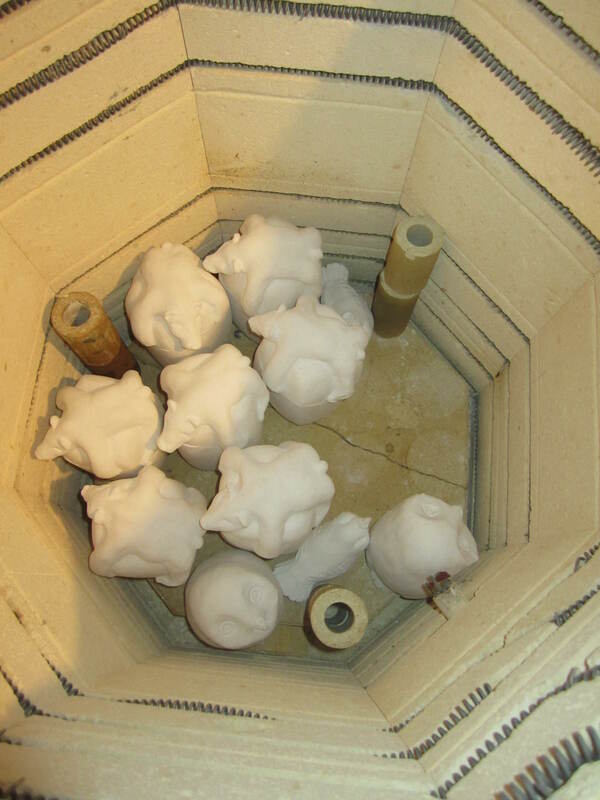 The photo below shows what the kiln looks like when I open it. Sometimes when people are watching me do this they ask “Is that hot?” Um, yes, yes it is! So now comes another part where I don’t have photos because I was too busy trying to have successful results to stop and take photos. It is really all about timing at this stage. I open the kiln, then using tongs I pull about 2 or 3 sets of tops and bottoms (4-6 pieces) out of the kiln. I put them on the ground or a piece of metal sheeting and let them sit out until I hear them start to “ping”. 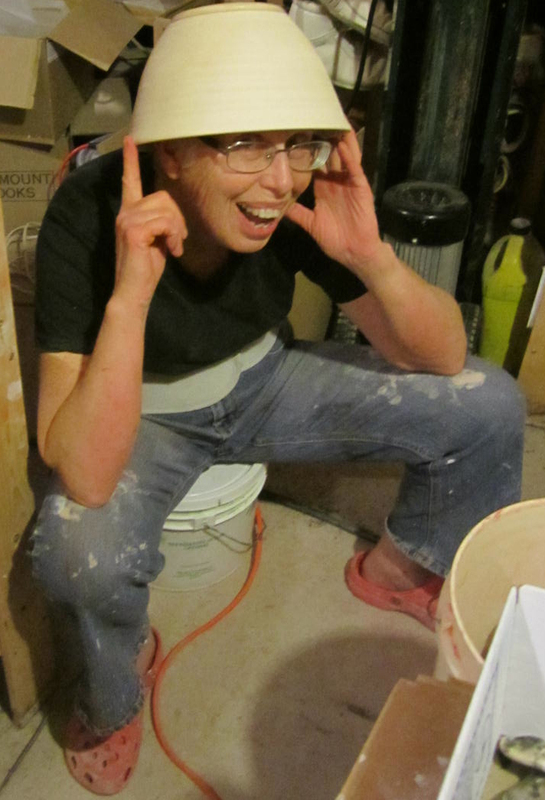 (I take more pieces out of the kiln while waiting for the pings.) The pinging is the glaze cooling and crazing. Then I put those pinging pieces into a garbage can filled with newspaper where they burst into flames. I pile a whole bunch of newspaper on top of that, kind of smothering the flames so it is smoking under there and then take the next set of pieces and put them onto that newspaper. 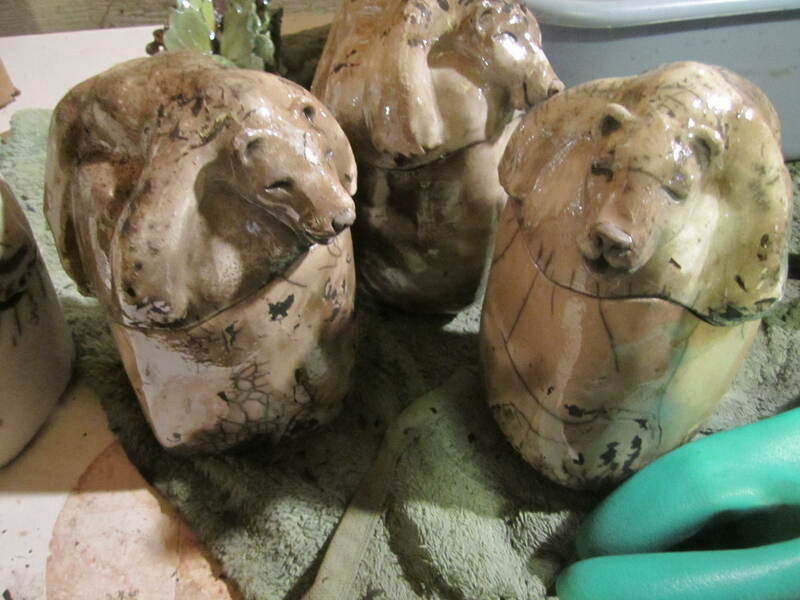 I do that until the kiln is empty, sometimes using more than one garbage can. I put wet sheets of newspaper onto the top of the garbage can to seal in the smoke and then a lid on top of that. As I mentioned, the carbon in the smoke will turn anything black that is unglazed and will turn the crazing/crackle in the glaze black as well. This is what the boxes look like after I have taken them out of the burned newspaper. 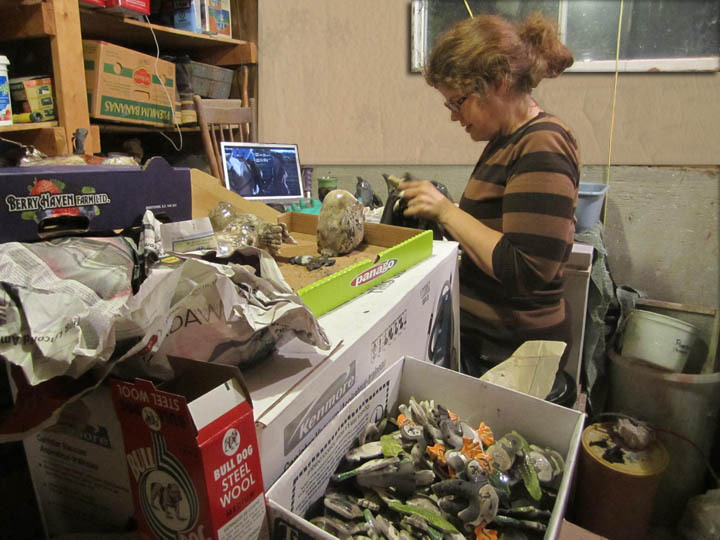 This is me at about 2:30 am cleaning the newspaper crud off of some of the pieces I fired. It takes an incredible amount of strength and scrubbing with steel wool to get the patina of smoke and the charred newspaper off of the boxes. As scrubbing raku is not the most exciting part of the creative process (read MIND NUMBINGLY BORING) I often watch Netflix tv shows or movies while I do it. I think I am watching Heartland here. Or Castle. Or Bones. No probably Heartland since I watched the whole series while I was working on making product for the market. Yup, if you look closely there’s a horse on that there screen. If you haven’t watched Heartland then you should, such a good show, reminds me of TV of the 90’s. Sweet, fun and not too heart wrenching. (Be warned, I also like Murder She Wrote and Matlock, so you can see where my viewing tastes lie!) Ok, back to scrubbing…. And the finished, scrubbed pieces! That’s the unglazed clay there on the foot.